SmartLab is a client-oriented IT company which offer IT support in all forms to clients to assist in the implementation and use of our technology products. After the completion of a project and upon warranty expiration, clients can choose to engage SmartLab in maintenance services. Maintenance service levels can be catered to specific client support requirements, to encompass value-added services including dedicated consulting resources on an annual basis for additional customization requirements that may arise due to change in business requirements. The purpose of Help Desk Support service is to assist the end users, in problem diagnosis, trouble shooting and errors resolutions. 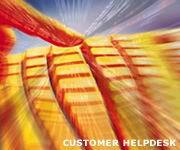 All users are welcomed to call or walk into our Customer Care Centre for Help Desk service. Our dedicated engineers may even to be stationed at clients premises on a "warm body" help desk arrangement. Both first and second level service agreements can be provided. Reports are provided to clients on a routine basis to analyze the utility of help desk services, diagnosing problem categories and to provide useful information for future training plans as well as software development strategies. You must have a valid Username to enter SmartLab Customer Helpdesk. Please contact your company's SmartLab Web Administrator for Helpdesk Management System to have your Username established. SmartLab Customer Helpdesk make serving yourself easy and secure. To effectively use these services, we recommend Microsoft Internet Explorer 5 or higher, or Netscape Communicator 4 or higher.